Get Rocked! 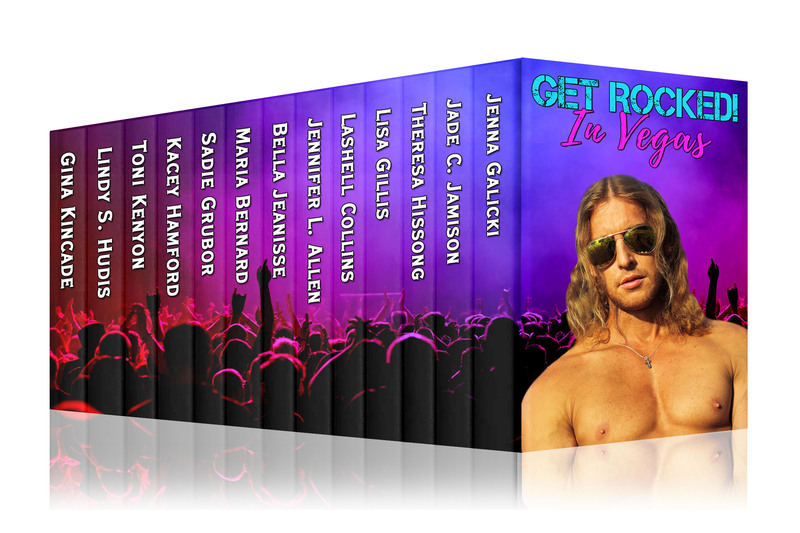 In Vegas: Rockstar Romance Limited Edition Collection – by Jenna Galicki, Jade C. Jamison, Theresa Hissong, Lisa Gillis, Lashell Collins, Jennifer L. Allen, Bella Jeanisse, Maria Bernard, Sadie Grubor, Kacey Hamford, Toni Kenyon, Lindy S Hudis, Gina Kincade. Let these scorching bad boys rock your world and melt your hearts as they burn up the stage at a Fictional Rock Festival in one of the world’s sexiest playgrounds! *Note: This Boxed Set is no longer available. Get Rocked Vegas Summer Music Festival is about to get started! We have 12 stories and they are all fantastic books. I have found some new authors and enjoyed catching up with some of my “old” authors that I’ve read before. If you are looking for something new to read, I know you can find something you will like in this boxed set. If you can’t, then you are missing some good rock bands. I voluntarily chose to review a copy of this book for review that I received from the publisher. Brandon is a drummer getting ready to play at his first festival. He’s very young and due to the way that he was raised, he’s very immature in life. He feels like a boy and he’s ready to be a man. If only his band mates would stop trying to shelter him. This was a good book showing how a boy took control and became a man out on the road. We meet Kit Ellis, bassist for the heavy metal band, Something Wicked, and Aiden Hawkes, vocalist for the band as they travel to Las Vegas. They are going to be an opening act at the Get Rocked Festival along with the other 2 members of the band. The chemistry between these two is out of this world! This is just one more great book from Theresa Hissong! The band is great together and you just want to rock along with them. Great book! Now I hope we get books on the rest of the band, too. Diego’s a rock guitar legend and a member of Medieval Steel. He’s got a serious girl friend and a very serious stalker. Wow! This may be a short book but it’s fantastic! It has a flowing storyline that keeps you on the edge of your seat! I can’t wait to read more of her books. Jay is the lead singer for the rock band, Southern Jackass. (You have to love that name.) He has a perfect pitch voice and could be the best singer in the field. But……. Jay has one small problem. He gets stage fright and can’t sing when he gets in front of a crowd. They also need a guitarist. In steps Alice. She’s amazing in more than one way. These 2 have major chemistry and are awesome together. What a great book this was! All the books in this boxed set are just as good as these 4. You will love them. A steamy collection of rockstar stories!! This is a steamy collection of rockstar stories that has something for everyone. Some of the stories included are a rocking duet with two bands, a couple of stalkers who were determined to get up close and personal with their favorite rockstars, and a couple of up and coming bands who won a contest to perform as the opening acts. There were a couple of Vegas rockstar weddings, including a fake one that was a prank and a bachelor party that got raided. The most unique storyline was about a young lead singer who couldn’t sing on stage because of extreme stage fright. My favorite was about a rockstar and an opera singer who had a tumultuous history and a surprising twist in their story. These stories had an eclectic mix of rockstars and love interests. I enjoyed this boxed set and found some interesting new-to-me authors. Fantastic box set. I enjoy rock star romances and this did not disappoint at all. Diversity through this collection had me glued to my kindle. The stories cover things you expect to find with the famous in Vegas; stalkers, weddings, parties and sizzling chemistry between characters. I highly recommend this set and I enjoyed discovering new to me authors. Great compilation of Rockstar reads. Some authors Ive read before, found some new ones as well. Was very excited to see Maria Bernard in here with Stand Up and Shout. It brought back a visit from the Stick Shift Lips and Dream Crush. I was so happy to find that this is Southern Jays story! Well done to all! Want to read the series that inspired Stand Up and Shout? Check out the Stick Shift Lips and get hooked!